Is there any wonder of child’s birth that medical science still can’t explain in this millennium? This is a question that has been asked several times especially when news of birth of a wonder child born with special powers, conditions, religious object and so on, circulates around in Nigeria. When babies are born with any of these conditions, the faithful often see it as a form of spiritual message to the believers but in the medical world, such wonder of child’s birth is just a hoax. The claims of children born with the supposed signs and wonders have proven to be one of the most controversial to logically present and defend except for the overwhelming witness who often claimed they saw the event and the hysterical way the news media often cover such stories. Parent of such wonder child and other witnesses often present physical proof to support their claims but the medical experts often claimed that such evidence must have been doctored or, in case it is an object born with the baby, implanted in the baby’s mother without her knowledge or just a medical deformity. Here are five weird wonders of child’s birth that occurred in Nigeria that are hard to dispute. But we will leave you to judge for your selves. During the one of the prolonged Oyo empire siege at around 1870, a child was born to the family of a peasant farmer in Ijaye land, who was to become one of the greatest warriors in the history of Yoruba race, the 5th Aare Kakanfo of Yoruba land. There was joy all round at the birth of the news of the baby boy’s but the parent soon found out that his birth has one of the weird wonders of child’s birth in history at that time. The baby boy was clutching to a miniature of bow and arrow. As was the custom of the Yoruba’s at the time, his parent enlist the help of a Sherman (Babalawo) who made the divination and told them that the child would be a great warrior and leader of his people. There was no medical science at the time to disprove such divination but today, such claims would be strongly contested as a mere coincidence or conspiracy of the baby boy’s parents and his local maid. Fast forward hundred decades from our previous entry on the birth of Kunrunmi of Ijaye land to the present age. On one of the weekends in November 2016, the residents of Kubuwa in FCT, Nigeria witnessed another weird wonders of child’s birth at the General Hospital in that area. A baby girl has just been delivered at the hospital with her palm joined by a single layer of skin. This is a medical condition that was considered to require minor surgery. As would be expected, necessary medical procedures were taken to make sure that the little girl’s operation is successful and it indeed was. Bizarre revelation follows when the child palms were separated and the medical team that did the operation saw the inscription scribbled on the girl’s hand. The small girl died shortly afterwards which makes the message on her palm to be ominous to those who are not following the teaching of Christ. In another development, another baby girl, holding bible in her hands, was born in Ila Orangun, Osun State. The local midwife who took the delivery of the small girl confirmed the incident. A report of the child born with Quran was also heard of in Lagos as well as the baby born with Islamic rosaries in her hands in Ogun state. These are wonders of child’s birth that medical team often have hard time explaining away considering the overwhelming witness that testify to the event. Could it really be a miracle? Could it be another conspiracy from the leaders of the alien religion? Or is there other intelligent life at work here? Only time will tell. A child was born in late 2015 at Akure in Ondo State which made the new all over the internet but what actually caused people to marvel at his birth probably has nothing to do with wonders of child’s but the supposed attribute or powers possed by this wonder boy. Unlike other children on this list, baby Samuel wasn’t born clutching to any object for that matter. But shortly after the baby boy was born, people around him claimed they started experiencing what they called miracle. There was account of people who are sick getting healed, dead business suddenly coming to live and started flourishing and sort of. 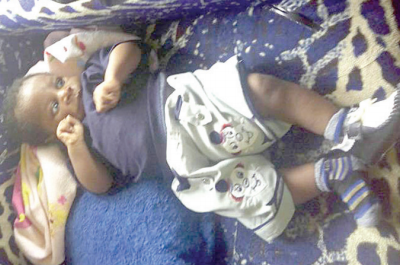 The news of the miracle power of the baby boy soon spread like wild fire in the dessert that the reigning monarch, Deji of Akure asked the parent of the baby boy to conduct another naming ceremony for him on the monarch’s account. The Nigerian atheists has often explained such weird wonders of child’s birth as a sign of mental slavery to the foreign religion but such case will soon be dismissed with reference to the birth of similar wonder child born with Olokun’s beads clutched in her hand. Mrs Funke Adamson, a traditional worshipper, on Monday, May 11, 2015 gave birth at a Trado Medical Center in Apapa, Lagos Nigeria. But to her surprise, her baby girl confirmed the prophesy given to her by Osun custodian during her early days of pregnancy as she brought with her a sparkling white Olokun’s beads. The mother of the wonder child claimed she has been having strange dream seeing herself in on the sea shore. To the Yoruba traditional religion ardent, that’s a sign from Olokun, the water goddess. Could this be one of the water goddess daughters or just another medical hoax? Perhaps this will be the easiest for the medical expert to dismissed with a wave of hand but all the same, it worth checking. On Oct 23, 2015, a post surfaced on one of the Nigeria most influential forum, Nairaland about a baby born with ever spreading birth mark. The post quoted a nurse who studied this phenomenon in the new born baby as saying… “Later in the day, while trying to bath the baby, the mother noticed a black spot on the forehead of her baby. She tried wiping it off, but it kept expanding with little drops of blood. She repeated same process till the symbol got expanded as you all would later see” (this statement has been paraphrased). The question is what does this symbol means? Is there any way it is related to all the weird wonders of child’s birth in Nigeria we already discussed?